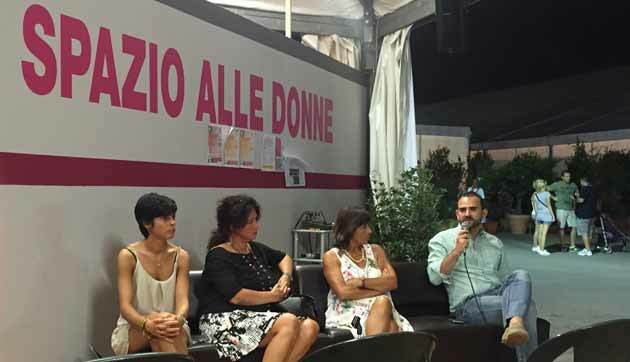 "Sportive and professional, without discrimination": this is the title of last night's initiative, organized by the Women PD Provincial Conference of Bologna at the Festa de L'Unità, which takes place in the North Park from the 26 in August to the 21 in September. Federica Mazzoni, President of the Conference, was introduced by the Councilor for Sport of the Municipality Luca Rizzo Nervo, the municipal councilor Marzia Benassi and Simonetta Bortolotti, member of the board of the Consulta dello Sport del Comune. Moderator: Lawyer Roberta Li Calzi, AIC regional manager and Imolese Calcio Femminile player. Cue of the evening the bill presented by Senators PD Fedeli and Idem the 30 last June, which will soon start discussion in Parliament, "Changes to the law 23 March 1981 No. 91, for the promotion of gender balance in relations between companies and professional sportsmen ", which introduces the prohibition of discrimination by national sports federations regarding the classification of the sporting profession. INITIATIVES OF THE ITALIAN ASSOCIATION SHOOTERS FOR THE ABOLITION OF THE CONSTRAINANT IN THE AMATEURS The Italian Footballers' Association, backed by the support of FIFPro (the International Soccer Union) and on behalf of the amateur footballers it represents in Italy, has taken the first step in political and legal action, at international and national level, aimed at to obtain the abolition of the so-called sports bond. The FIGC is the only football federation in the 27 EU member countries to foresee today the existence of a contractual bond for amateur football players, until the completion of the 25 year of age. On the basis of this simple factual finding, but also on the conviction that the sport tie is contrary to the fundamental principles of the Italian Constitution, labor law and community law, the AIC has invested the Community institutions on the question of its legitimacy. In particular, the 12 November 2009, the Hon. Iva Zanicchi, Member of the European Parliament and member of the Culture Commission, presented a written parliamentary question, requesting the intervention of the European Commission, to verify compliance with the current legislation adopted by the FIGC in the light of Community law, specifically free movement of citizens and workers, as well as competition law.